The officials formally invited Magsaysay to attend inauguration of the company’s new oil refinery in Bauan on the 11th of the same month2. 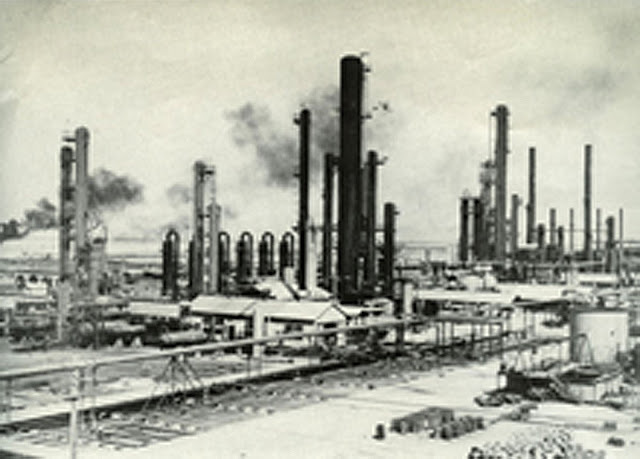 Contemporary readers will probably know the refinery to be in present-day San Pascual. This town, however, used to be part of Bauan until it was made into a distinct municipality in 1969. Five days later, the President flew on board a four-seater plane to Bauan, landing just before lunch on an auxiliary airstrip in the town3. He was accompanied by Brigadier General Eulogio Balao, Vice-Chief of Staff; and Major Emilio Borromeo, Presidential Aide. He was met by then-Speaker of the House of Representatives Jose B. Laurel Jr., Batangas Governor Feliciano Leviste and Congressman Apolinario Apacible of the 1st District of Batangas. Magsaysay was a popular President, and an “enthusiastic crowd” must have turned up at the airstrip to greet him. According to the Official Gazette, from which we obtain details of the visit, he expressed his appreciation to those who had shown up to welcome him before motoring to the refinery accompanied by Laurel, Leviste and Apacible. There, they were received by Bramstedt and Roesholm, along with Lipa Bishop Alejandro Olalia and Raymund A. Spruance, then-American Ambassador to the Philippines. Magsaysay left for Manila shortly after the ceremonies and was back at Malacañang by late afternoon. Just as a footnote to this article, Caltex Philippines closed the refinery in 2003 and in its place opened a ₱750 million “world class finished product import terminal5. 1 Caltex is “a petroleum brand name of Chevron Corporation used in more than 60 countries in the Asia-Pacific region, the Middle East, and Southern Africa.” The name is the shortened version of California Texas Oil Company, a joint venture between the Texas Company and Standard Oil of California. “Caltex,” Wikipedia. 2 “Official Gazette of the Republic of the Philippines, Volume 50 Number 12,” online at the Internet Archive. 3 Information about Magsaysay’s refinery visit also from the Official Gazette. Op cit. 4 The Philippine Legion of Honor “is conferred upon a Filipino or foreign citizen in recognition of valuable and meritorious service in relation to the military affairs of the Republic of the Philippines. It is thus the primary order of military merit of the Republic of the Philippines.” “Philippine Legion of Honor,” Wikipedia. 5 “Caltex closes refinery,” by Donabelle L. Gatdula, published 2003, online at The Philippine Star.